Below (scroll down) is a tornado watch that continues in effect for parts of Oklahoma and Texas. 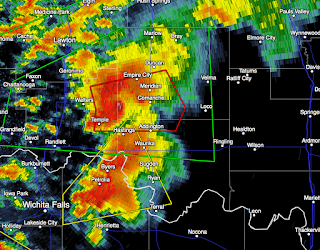 Commanche and Meridian, Oklahoma are in extreme danger. There have been multiple reports of tornadoes, some of which have caused damage. I urge you to keep an eye on the weather if you are in the tornado watch.